Hi ladies! It's Monday, which is my busiest day of the week, so I'm running around all day like a madwoman. Also, I'm hungry. And I'm severely disappointed in my current mani and I'm really itching to take it off, but again... Busy Monday. Blah! 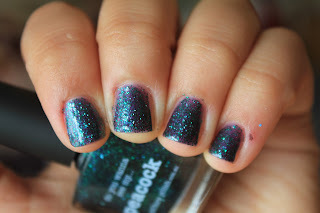 There's some itty bitty bar glitters in here that really intrigue me! I love this polish so much. So so so much. I want to wear it again right now!! 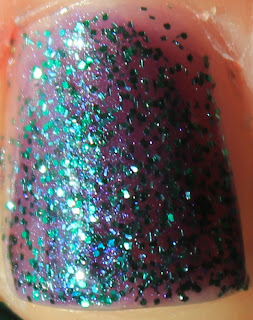 The formula was great, and the the purple base is PACKED with emerald glitter, so I'm a happy camper. 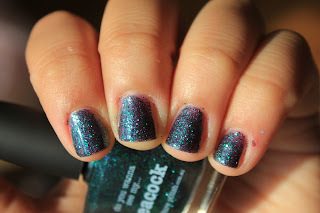 Also, you should know how I feel about glitter and shimmer together. It makes my sparkle-loving heart just so happy! Also, this makes me want other Picture Polishes so badly. Monroe, anyone?! Drool. oooh I love it! I did not realize it had a purple base - now I REALLY want it! And Monroe...drooool!